If you like Python(on TM Radio for over 12.6 years), please, consider telling your friends. Python is a trio based in Rostov-on-Don (Russia). It was formed in 1998. 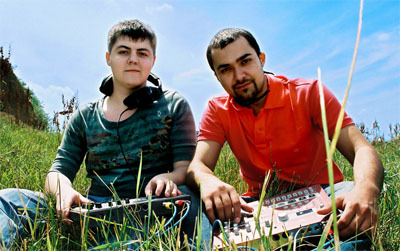 Members are Yura Kolomiytsev,Alexei Samotarev (aka DJ Samotarev) and Eugeniy Litovchenko. At first, the project worked in house and break beat styles, their tracks appeared on many Russian compilations. Since 2002, the Python project has moved into Tech-House, Progressive and Electro, and by 2004 they released their first album "DeePressure"
The Python project has now progressed to create a stunning new live act with inclusion of live bass guitar,violin and percussion. In the 2006 they signed some tracks at Climax, Xeton and Neuroscience labels. Tracks of Python project were supported and get positive feedbacks from such DJs as Armin Van Buuren, Andy Moor, Flash Brothers, Sasha, Matt Darey, Lisa Lashes, Moshic, Christian Cambas, Chris Micali, Eric Entrena, Joel Armstrong, Matt Rowan, Mike Hiratzka, Miika Kuisma, Gabi Newman,D-phrag, Nicholas van Orton, Dean Facer, Dom Kane,Eelke Kleijn, DJ Tarkan, Noel Sanger and many more. Their mixes appeared on DI FM, Frisky, Pure FM, Proton, ETN FM, Vonyc, KSK radio (Argentina), Top radio/Rotationz (Belgium), Dance Radio (Greece), House De Luxe (Luxembourg), CRMK 89,8 (UK),Liquid FM (Norway), ADN Alternative, Justmusic FM (Hungary), Afterhours 99.1 FM (Peru), ensonic FM (Germany),Tribal Mixes,Sensegenerate FM, MercurySessions,Rouge Platine, XTC, Clip FM 88,7 (Brazil), Infected (Germany) and Radio O FM 102.5 (Argentina) just to name a few. In 2006 they started label called Carica Records. Main aim of this label is to release quality progressive music from different parts of the world. Also Carica has 3 sublabels Carica Revelation Records, Carica Limited and Carica Deep , focused on trance, electro and deep tech music. Their label got support from Armin Van Buuren, Paul Oakenfold, Markus Shultz, Hernan Cattaneo, Flash Brothers, Andy Moor, Andrew K, Slacker,Mystic Force, Airbase, Kaya & Albert, Ronski Speed, D-phrag, Nicholas Van Orton, Snake Sedrick, DJ Tarkan, Noel Sanger,Suzy Solar, Eric Entrena, Christian Cambas, Miika Kuisma, Deviant, Yves Eaux and more. Python also host some radio shows at different radios. Among them there are di.fm, frisky, proton, etn.fm, pure.fm, ensonic.fm, tribal mixes, danceradio.gr and many more. Among guest of their show you can listen to such DJs as : Samy Fresh , Defender Droids (Nicholas van Orton & Rhino), Ken Cable, Anna Maria X, Onirika, Suzy Solar, Pilot , Mike Brin, Dark Globe, Leama, Andy Moor, Deepsky, Christian Cambas, Miika Kuisma, Flash Brothers, Chloe Harris, Silent Brothers, 4Mal, Matthew Adams, Jalebee Cartel, DiKomm, Solid Sky, Mewel, Davis & May, Vibrasphere, Matt Rowan just to name a few. Nowadays Python is working with such labels as Proton, Balkan Connection, Presslab, Second Coming, Neuroscience, Footlovers Music, Real Music, Bellarine, Pure Substance, Segment, Composure, Swordtail, Magnolia Digital,Polytechnic and the list goes on. No preset schedule (taking a break). Show first aired on January 6th, 2007 and new episodes were coming out until October 6th, 2007. A total of 9 episodes of Snake Attack has aired on TM Radio. No preset schedule (taking a break). Show first aired on December 27th, 2006 and new episodes were coming out until March 25th, 2008. A total of 14 episodes of Green Temptation has aired on TM Radio.